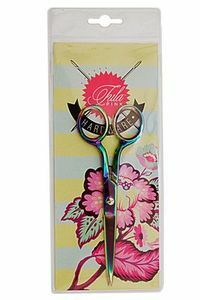 These 6 inch straight sharp point scissors have razor sharp blades that create an even cut along the entire length of the blade. Great for trimming fabric edges and threads closely, accurately, and quickly. Also for use in trimming fabrics, stabilizer, applique, and all needle arts and crafts. Another great addition to the Tula Pink Hardware Collection.